Up until the 1960s World Civilization was considered to have started in the Middle East and Mediterranean with not much of any consequence elsewhere. Pioneers such as Dr. Needham ➚ at Cambridge University, U.K. discovered that many of the great achievements in science and technology actually originated from China. Working out who invented precisely what and when is a daunting task as contemporaneous records are fragmentary. The first invention of something is by its nature an isolated event and it is unlikely that the initial discovery is faithfully recorded. It is only when an invention becomes widely used that there is a realistic chance that someone will have written down an accurate account. Even so it is quite possible for the same idea to be independently discovered in several places at more or less the same time, greatly complicating any search for the origin. So tracing the first appearance of something is a case of careful detective work. An invention in one place can lead to it being found after a hundred years over a very widespread area. Also an invention may not have been taken up immediately; there could be a long gap before adoption. In the case of China, the trade between Rome and China in the Han dynasty is well known and documented. Along the desert Silk Roads between the two great civilizations of the time there must have been the transmission of objects of the greatest value: ideas and inventions. As direct contacts between 'Europe' and 'China' were few it was the Central Asian intermediaries who traded in the strange new inventions from the mysterious East. China traditionally lays claim to four great inventions: paper; printing; gunpowder and the compass. It can also make a justifiable claim to many other inventions including: Iron casting; Examinations; Spaghetti; Fans; Porcelain; Blast furnaces; the Abacus; Ship rudders; Silk; Planetaria; Printed books; Pasta; Kites; Paper money; Ice cream; Wheelbarrows; Acupuncture and many more. Paper is considered one of China's greatest inventions. Paper seems such an uninteresting thing, but when you think of it, the development of all scientific, historic and artistic endeavor has needed a durable writing medium for permanent records to be kept. Other materials like stone and pottery are permanent but just too bulky and slow to fashion in any quantity. In Egypt the somewhat similar substance papyrus ➚ was developed at about the same time as paper in China. It is made from the central core of papyrus (a type of reed). It is from this origin that the English word ‘paper’ is derived. However it is the Chinese form of paper that proved superior and longer lasting. In the cold, moist climate of northern Europe writing on vellum (animal skins) became dominant for greater durability, as paper made from papyrus only lasted a few decades before it fell apart. Good quality vellum ➚ (parchment) is expensive to produce and was reserved for official documents, it remained in use in Britain up to the 16th century. In China paper is considered to have been first used as a writing substrate in the Han dynasty, fragments have been found as far back as the 2nd century BCE but more definitely 109CE. The first paper was made from fibers from bark, hemp (a nettle-like herb) and flax (linen). The secret is to create something tough enough to withstand folding and crumpling and it is the flax and hemp fibers that provide the strength. One key advantage of paper over vellum and papyrus is that the ink is absorbed into the fibers and can not be easily removed; this makes any modification easy to spot - an essential attribute for official documents. Over the centuries the ingredients have varied, in Ming times bamboo was used extensively. The bamboo was chopped up; pounded and then mixed with lime to break it down into fibers. After boiling for a day the pulp is laid out on mesh frames where it can then be pressed and dried. 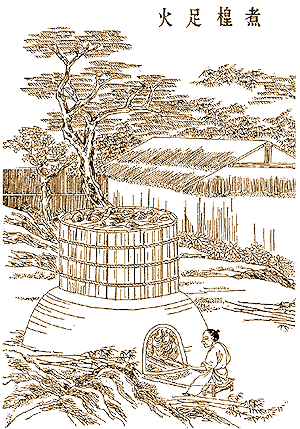 The legendary inventor of paper is Cai Lun ➚ 蔡伦 (50-121CE) who is reputed to have watched the behavior of wasps making their nests from wood and bark. There is a tale that he despaired of making a living from his invention, so he feigned death, he instructed his mourners to burn his stack of paper. He then miraculously came back to life, and the paper became immediately associated with immortality and then became a popular product to burn at funerals up to the present day. The Chinese character for paper is 纸 zhǐ, it has the radical for silk which is combined with the symbol of a 'water plant' on its side giving an impression of something being flattened. 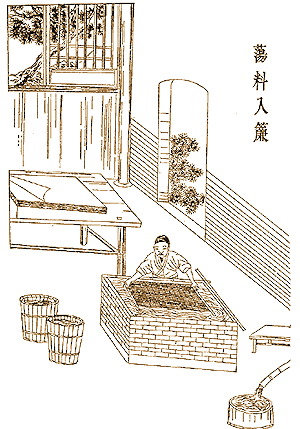 Before paper was invented writing in China had been on bamboo strips; silk or wood. The bamboo strips were tied together through a cord running through holes at the top and bottom and could then be rolled up into a scroll. This was ideal for official documents as the string could be embedded in clay and marked with a seal so that the document could not be read without breaking the hardened clay. Paper replaced them for most purposes by the 3rd century CE, but the paper was still pasted onto a backing to form a long scroll. A bureaucracy was already in place producing thousands of records each year that all needed permanent storage. By the Tang dynasty just the tax department is estimated to have needed 500,000 paper sheets. Paper had other uses too, as a fine durable sheet it was used for clothing and bedding. Multiple layers of paper can actual serve as an effective armor against arrows. Use as toilet paper can be traced back to an account from 851CE. It is believed that a pivotal moment in World history happened at the Battle of Talas 751CE. As well as beating the Chinese, the Muslim army captured Chinese mercenaries skilled in paper manufacture. Although paper was known in the Arab world before this date the precise method of production was unknown to them so the capture permitted the first paper mill outside China to be built at Samarkand ➚. It was not until the 12th century that Arab traders brought paper technology to Europe, and it is no coincidence that rapid European development took off as soon as paper was widely available. Writing in China has always been important as the many different spoken languages and dialects made verbal communication impossible, putting everything in writing was the only answer to this problem. 1. Harvest bamboo poles and trim off the leaves, then soak in water. 2. Boil up the bamboo stems with lime over a fire. 3. Sieve the pulp onto mesh frames. 4. Press the paper on stacked frames to squeeze out the water. 5. Dry the paper on the wall of a heated chamber. Made possible by paper, printing, is another major contribution to civilization invented by the Chinese. The earliest complete printed book is the Diamond Sutra ➚ of 868CE produced by putting ink on an incised wooden block. Buddhist text with its repeated mantras is an ideal candidate for printing as religious texts never need modification. The characters are carved into wood (from boxwood or honey locust tree) and then ink rolled over the surface, paper will then take the ink to form a reverse image of the wooden block. Using these techniques a single block could produce 20,000 copies and 1,000 copies could be produced each day. A print run of one million copies was not unheard of - and this is back in the 8th century (for book excerpts rather than complete books). It is thought that for one popular book of the 10th century 400,000 copies still survive. The use of complete hand carved wooden blocks was also ideal for printing the many standard classic texts that students needed to study in the ancient Civil Service Examination system. The Confucian Classics were first printed in 952CE. For high volume printing copper blocks were used, in this case the text was inscribed into soft clay which when hardened was used as a mold for the copper plate. The Peking Gazette holds the record for the oldest and longest published periodical. It was printed each day for about a thousand years until 1912. Like the London Gazette ➚ it listed the diary of events at the Imperial court including edicts and appointments. A page from the oldest known printed book - the Diamond Sutra, discovered near Dunhuang by Sir Marc Aurel Stein ➚ in 1907. The Chinese went on to produce printing by a system of moveable type ➚ in 971. Each character needs its own block and unfortunately there are thousands of characters. Even though the characters can be arranged according to their sound this still required a lot of searching to find the appropriate character. So moveable type was only feasible for mass produced popular, classic and religious books where the same blocks of type were used again and again to produce many thousands of copies. Prior to the introduction of printing, the important Classic texts were inscribed into stone as 'steles'. A student can make a copy by either reading it directly or, more usefully, make a wax rubbing of the characters onto paper. This was effectively an early form of printing, as a single inscribed stone could produce an indefinite number of copies. This technique for reproducing the Classics of Chinese literature was used at an impressive scale in 175CE near the then capital of Luoyang; 200,000 characters were engraved on fifty huge stones, a process that took eight years to complete. The ‘Forest of Stone Tablets’ (833-37) can still be seen near Xi'an. In Europe it was Gutenberg ➚ in 1450 who invented and developed a printing press. As in the case of China it was religious texts that had the popular appeal to make printing worthwhile. It is after him that the Internet book archive the Gutenberg project ➚ has been named. European languages with far fewer letters proved much more amenable to printing using moveable type, it was not until computers became widely available that printed Chinese character books have become easier to produce. However, Europe had a lot of catching up to do. The Jesuit Matteo Ricci (c. 1600) reported 'the vast number of books in circulation here and the ridiculously low prices at which they are sold'. One publisher was producing 600 titles with 100,000 wooden printing blocks. Cheap and low quality books were produced at Masha and Shufang, Fujian. Generally books were printed on one side of thin paper and folded to form a book (but reading from the first page at the back not the front). Readership became very widespread and covered all sorts of subjects. Gunpowder is classed as a great Chinese invention. Its use in fireworks and all types of gun has had the utmost effect on world history. Initially it was used as a ‘fire drug’ to disinfect the skin. Hence its name in China as 火药 huǒ yào or fire medicine. It was used as a fumigant and fungicide as early as 4th century BCE, reflecting the fact that sulfur was the main ingredient. It was contact with Central Asia near Samarkand that brought saltpeter ➚ into China which added explosive properties to the powder. Initially only 50% saltpeter (KNO3) was used as a higher proportion (75%) gives it a much greater explosive potential and commensurate danger in handling.. It was used by alchemists in their futile search for turning ores into silver and gold. This happened around 850CE. 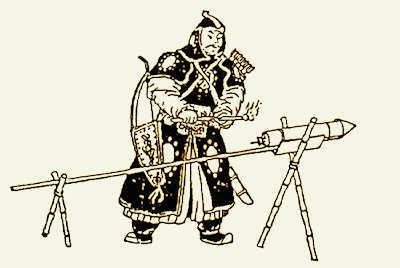 An early Chinese rocket powered by gunpowder. Use of gunpowder for fireworks at festivals began early on but it was not until the Song dynasty that it started to be used in weaponry. In the 10th century it was used in 'flying fires' as an incendiary arrow with devastating effects on wooden defenses. The earliest written formula for gunpowder is from 1044 with saltpeter; charcoal and sulfur as ingredients. It was then developed to make smoke bombs; fire lances; mines; cannons; bombs and rockets for warfare, principally against the Jin who had conquered northern China. The first known illustration of a cannon is from 1127. Rocket technology soon produced the multiple stages that are needed for long range propulsion. The conquest of China by Mongols led to the dissemination of many Chinese inventions including gunpowder via the Middle East to Europe with devastating consequences. Refinement of gun design by the Europeans gave them superior fire power, and although the Chinese had heavy cannon there was no Chinese equivalent of fast loading rifles or machine guns before the 20th century. This proved crucial at the time of the Opium Wars and Taiping Rebellion. It was European manufactured guns and rifles that supplied both sides of the Taiping rebellion rather than Chinese manufactures. When Qing Emperor Qianlong was shown a British model of the 100 gun ship 'Royal Sovereign ➚', he was perhaps unaware he was seeing the re-introduction of China's own gunpowder technology that had been developed to deadly effect. Firecrackers are set off at many festivals and family celebrations. They are particularly prevalent at the main annual festival Spring Festival / Chinese New Year - where they are so popular that they have been banned in central Beijing to give residents some peace. 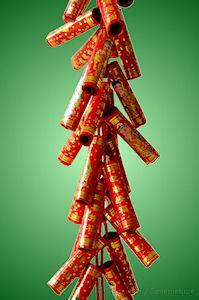 In China firecrackers are known as baozhu (爆竹 bàozhú) which means exploding bamboo as they were traditionally made by filling the core of bamboo tubes with gunpowder. Nowadays the bamboo is replaced by cardboard or plastic, the loudest noise is produced when the gunpowder is very densely packed. The loud bang was intended to scare off evil spirits - firecrackers create as much noise as possible rather than a pretty visual effect. Sometimes they are packed into many layers of red paper so that they leave fragments of lucky red paper all around. Gunpowder was used for firecrackers long before its use in making weapons. Firecrackers are made up into long strings of 'bangers' set off with a single fuse so that a large number of bangs go off in quick succession. As well as the noisy bang type more colorful and artistic fireworks are used at festivals and parties. The city of Liuyang in Hunan is a center for making firecrackers and other kinds of fireworks that are exported all over the world. Without the humble compass navigation by land and sea is perilous. With a compass, rocks and islands can be avoided even when visibility is very poor enabling sea trade to flourish. Once again it was the Chinese who first developed the compass that permits safe travel over long distances. The use of a magnetic compass goes back probably to the Zhou dynasty. The stimulation for the development of a magnetic compass came from the need to measure accurate directions in Feng Shui. Early compasses were lodestones ➚ - lumps of iron ore that were naturally magnetized to align with the earth's magnetic field. Early mining for iron had discovered these lodestones which are made of magnetite ➚. 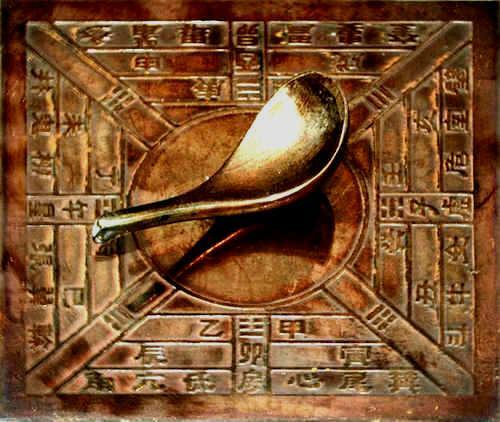 A Han dynasty magnetic compass, the needle is in the form of a carefully balanced ladle that points south. Emphasizing the independence of the discovery, in China the compass is called the point south needle 指南针 Zhǐ nán zhēn. Chinese cartography used ‘south’ rather than ‘north’ as the prime direction. Old Chinese maps had south at the top of the map so to Western eyes appear ‘upside down’ - the convention of which is the prime direction does not matter as long as it is used consistently. Using south rather than north has the advantage that this is always the direction of the sun at midday. Early compasses were made in the form of spoons and ladles carved out from a lodestone, it was not for a thousand years that technology allowed the lodestone to be fashioned into a small light needle and become the familiar form of the modern compass. 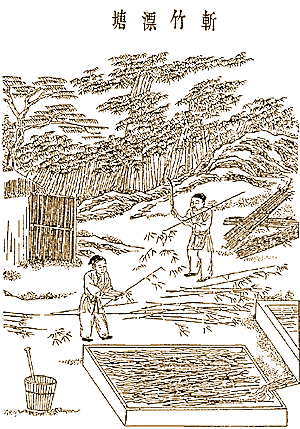 Chinese versions often suspended the needle on water as described in the ‘Dream Pool Essays ➚’ 1088CE by Shen Kuo ➚. During the Song dynasty compasses became widely used in Chinese ships. Accurate data was collected on tides; distances and water depths. This knowledge enabled Zheng He to make his incredible voyages of world exploration. An ingenious early Chinese invention was the South pointing chariot. Mounted on the carriage was a figure who apparently, as if by magic, always pointed his arm to the South no matter which way the chariot was turned or how far it traveled. The contrivance used no magnets and is mentioned as far back as the Han dynasty with Ma Jun ➚ as the possible inventor. How it could always point south must have caused endless amazement. The secret in fact was that clever differential gears kept track of the rotation of the wheels and any slight difference made when the chariot turns a corner moves the arm of the figure. It is a form of dead reckoning, to continue to point south the chariot must first be accurately pointed south (with a compass), and any slight slip of the wheels will accumulate and give an inaccurate direction. The abacus is first known in China from the Northern Song dynasty through the work of Shao Yong ➚ (1011-1077). Like many early inventions it is not clear precisely where it originally came from. Some say Central Asia; some Asia Minor and others China. The English name ‘abacus’ comes via Latin and Greek ἄβαξ based on a Middle Eastern form in the 3rd or 4th century. As it is a logical development from counting with stones it may easily have developed independently in several places. In China the abacus is called Suanpan 算盘 suànpán or ‘counting plate’. Needham ➚ believes it was first mentioned in the Shu Shu Ji Yi ➚ by Xu Yue c. 190CE. The process of counting using balls on rods is early in most civilizations and there is evidence for this in China in the Warring States period. The Chinese abacus is based on counting in fives which is a natural step from counting on fingers in batches of five. An abacus was in widespread use in the Han dynasty for addition; subtraction; multiplication and division. 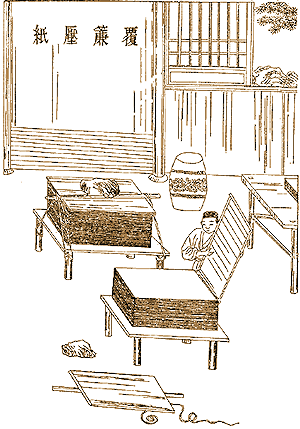 During the Tang dynasty the principal manual for counting (probably still with counting rods) was the 算经十书 Suàn jīng shí shū (Ten canons of calculation). By the Yuan dynasty (1311) the 南村辍耕录 Nán cūn chuò gēng lù mentions moveable beads. 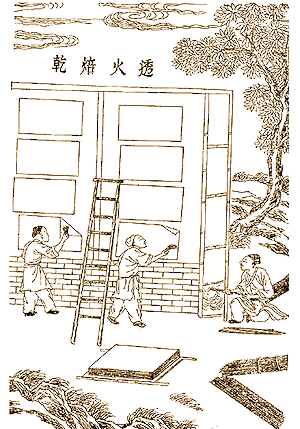 The modern abacus may not have evolved until later; with an illustration and detailed instructions for use, it is clear that it was in use in 1593 according to the 算法统宗 suàn fǎ tǒng zōng by Cheng Dawei ➚. The traditional Chinese form of the abacus has five flattened balls separated from two others by a bar (the 2:5 arrangement). The balls are all threaded onto a rod. There are between 11 and 17 rods in total. Normally the balls above the bar are counts of fives, so on each rod it is possible to represent 0 to 15 or 1 to 16, the overflow above 10 is useful for temporary results especially in division. Normally the abacus is used for decimal arithmetic - counting in tens with each rod representing one digit. To allow for fractions one rod, sometimes in metal represents the decimal point, to the left are units, to the right are fractions. The ability to count to 16 was useful when old measure units of 16 were used. Another form of the abacus has just one separate ball (1:5) and so does not have a 'carry' capability. To see how the abacus can be used to perform calculations please visit these external web sites: addition ➚; subtraction ➚; multiplication ➚; division ➚ as well as square and cube roots ➚. The general technique is to combine the two sums starting at the rightmost digit and working left, using carry operations when necessary. A similar functionality can just use balls on a grooved board using two different colors of ball. Putting the balls on rods allows for a fast reset; modern abacuses have a button to reset all the balls back to zero. On a reset, the upper register (heaven) balls are pushed to the top and the lower register (earth) balls are pushed to the bottom. The bottom five balls are moved up with the thumb and down two with the first finger. The two top balls are moved with the middle finger. Counting on market stalls by the abacus was widespread by the Mongol period and continued through to the advent of electronic calculators. Skilled use of the abacus enables people to calculate remarkably quickly. This skill benefits mental arithmetic too, some of the fastest human calculators achieve this by carrying out the calculation on an imaginary abacus, visualizing where the balls lie. Teaching the use of the abacus was widespread until recently. Children are still taught the abacus at primary school in order to improve their mental arithmetic and manual dexterity. Citation information for this page : Chinasage, 'Great Chinese Inventions', last updated 30 Nov 2016, Web, http://www.chinasage.info/inventions.htm.